Welcome to the Box Office Report where we don't understand what this newfangled video game movie is. What ever happened to the Super Mario Bros. movie? We knew almost nothing about this movie before ten minutes ago. We vaguely knew John C. Reilly was involved and that it's about a video game character. That's it. Upon watching the trailer, we were sold with the clip of the scene of the video game villain support group. "My name Zangief, I am bad guy," was what did it. We get the near $50 million gross now. It's also about overcoming preconceptions and a bunch of other feelings malarkey, but we like Zangief jokes. We're simple. Robert Zemeckis finally stopped directing creepy computer animated Christmas movies and somehow was able to get Denzel Washington to stop mailing it in. Denzel has played Denzel in every movie he's done since Training Day, so it's nice to hear he finally read a script and brought his worker boots. There haven't been whispers about Oscar potential. People are practically screaming about it. A lot of Canadians thought the brief mention of Halifax, Nova Scotia in Argo was the best mention of Halifax, Nova Scotia in any movie, ever. Final word: they say that every time someone mentions Halifax, Nova Scotia in a movie. Canadians just like it when you talk about them. Fourth place is unacceptable for a kung-fu movie directed by the RZA, starring Russell Crowe (! ), with bit roles from Lucy Liu playing her character from Kill Bill and a former professional wrestler. What more do you want, America? Are you not entertained? We have to give Liam Neeson some credit for still being here. Taken 2 doesn't have half the word of mouth the original had and yet it's still persisting. Cloud Atlas, the completely insane and sort of racist mess that's also probably the most fun you'll have at the theater this year, was relegated to sixth. We're disappointed. More people need to see it. 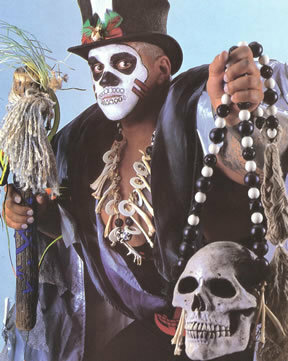 How are we supposed to make jokes about Hugh Grant playing Papa Shango now?